Orange it is! I bought this designer paper from SU! last fall when they had a warehouse cleaning out sale. It was a great value and a terrific match for many of the photos from the kids visit last summer. I'm a little backwards here doing their last night with us as one of the first pages. I've had this felt and paper laying around for about two months. Finally, the Splitcoast challenge to use orange prompted me to get it done. I made the felt accents myself using my Cricut to cut patterns. I'll do a TIPsy Tuesday on this after I've had a chance to play a little more. It was rewarding using these old felt pieces from some abandoned project I can't even remember. Plus, I even put my embroidery thread to use! 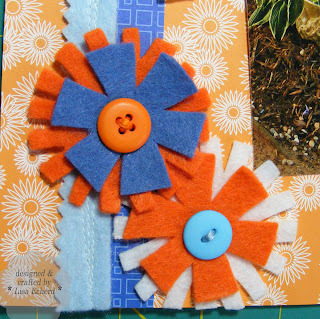 My button stash is seriously depleted though - in orange and bright blue for sure. 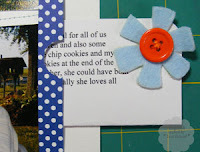 The felt shapes were cut from patterns made by the Cricut's Accent Essentials cartridge. I cut out the images, traced them on the felt and then hand cut. 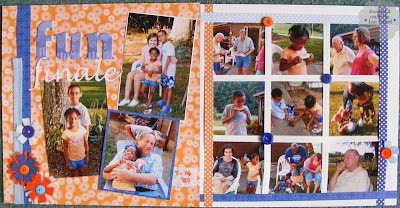 To get 12 photos on these two pages, I hid the journaling under the photos. I wanted to use a lot of photos to show what a fun night it was for everyone. I typically just use Times Roman or Arial and black print on white cardstock for hidden journaling - nothing fussy. 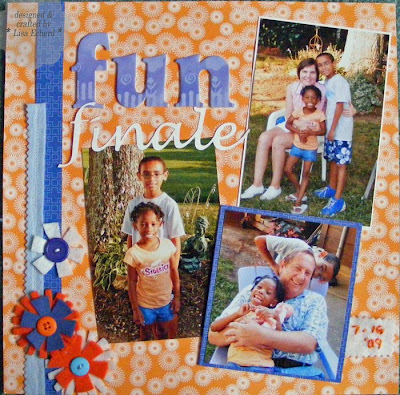 "finale" is also cut with the Cricut using SCAL software. The font is Lucida Handwriting. 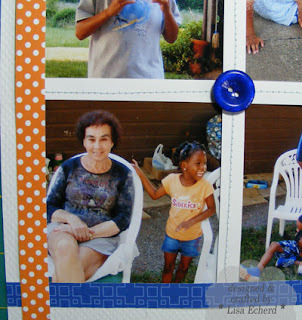 I tried designer paper for the strips between the photos but it was just too busy. 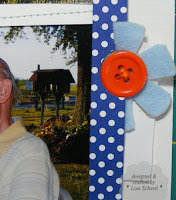 White cardstock strips sewn with light blue thread gave the design enough texture without competing with the photos. Oh, these warm weather photos and the pretty day we had yeseterday have me aching for Spring. Lenny and I took a walk in the woods yesterday. He wore shorts. I actually got by without a jacket - a miracle for me in February. Such bright and beautiful colors and pages.. just like all those wonderful smiles!